Hi! 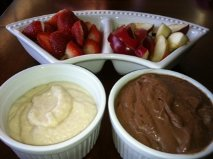 I would LOVE to make this fruit dip but am having a hard time finding coconut flour around me – closest place is 1 1/2 hours away! Is there any way coconut flour & milk can be substituted for both almond flour and almond milk or is that a bad idea? I know I can always order coconut flour but would like to make this for a beach picnic this weekend! Please help :). Thanks for checking out the blog. I think the key ingredient in this recipe is the coconut milk, the canned version. This is what makes the dip creamy, almond milk would not work. I think if you had a way to keep the dip cold while it was being served you could likely get away without using the coconut flour. It’s essentially used as a thickener in this recipe. So, if you can get canned coconut milk, you can make the recipe. Best of luck! Thank you! After calling around everywhere, I found coconut flour at some herbal/vitamin place! Turns out they have a whole grocery section! I will be making this for our beach trip tomorrow, can’t wait to try it! 🙂 Love the looks of all of your recipes, there’s many more for me to try! Thanks for your help!